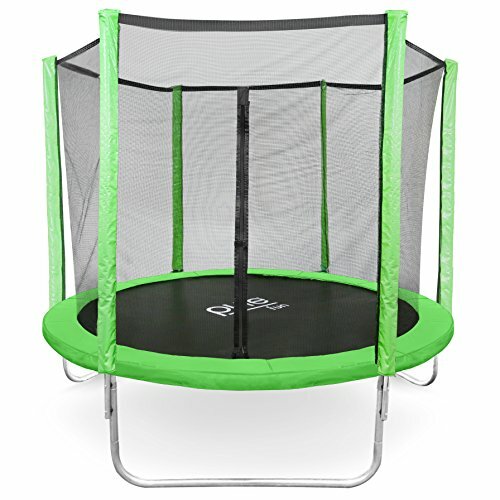 The Pure Fun Dura-Bounce 8ft Trampoline with Enclosure is the perfect set for kids who need a little more room to polish their jumping skills. This well constructed trampoline set is made with heavy duty steel frame construction and top of the line safety features. Including a tight enclosure netting to help prevent bouncers from falling off and heavy duty zipper access which allows for easy entry and exit. Bouncers will eliminate bumps and bruises with the protective spring pad and foam enclosure poles for added safety. This 8 FT Set is constructed with steel U shaped legs which prevent the trampoline from tipping or wobbling. While its 48 high quality galvanized springs provide the ultimate bounce and smooth landing! Most importantly, the Pure Fun Dura-Bounce 8 FT Trampoline Set is ASTM approved and TUV/GS Quality & Safety certified. Assembly is minimal for hours of jumping fun for you and your family! Recommended for children ages 6+ with a 250 lb. weight limit.